Captain Olimar (or simply Olimar) is the main protagonist of the Pikmin franchise, created by Shigeru Miyamoto. Olimar is actually named after Mario himself (Olimar is an anagram of Mario, with an L added; his Japanese name, Orimā, (オリマー) which was romanized as Olimar, is a near perfect anagram of "Mario"). He has crossed over with the Mario franchise primarily through the Super Smash Bros. series, but also through Nintendo Land as well, where Pikmin gets its own attraction, titled "Pikmin Adventure." Most of his other appearances involve cameos via use of amiibo. Olimar has to be scaled up drastically, even more so than Kirby, for his appearance in the Super Smash Bros. series, as according to the Pikmin game manual, he is only about an inch tall. Olimar does not have any voice effects (unless players count his whistles as a voice effect) in Super Smash Bros. Brawl, making him the only playable character without a star KO sound effect. In Super Smash Bros. for Nintendo 3DS and Super Smash Bros. for Wii U, Villager, Pac-Man, Mega Man, and Mii Fighters also lack voice clips, making a lack of a voice effect no longer unique to him. However, in Pikmin 2, Pikmin 3, and Super Mario Maker, he is voiced by Kazumi Totaka. A trailer for the first Pikmin game, which includes Olimar, appears in Luigi's Mansion's option screen. Olimar was planned to make an appearance in Mario & Luigi: Superstar Saga as one of the characters that appears when Mario and Luigi create new brews in Starbeans Cafe. In this appearance, his dialogue was written in the type of text box that appears whenever Mario or Luigi get certain items, as though written in a log book like in the actual Pikmin games. He also names Mario "Marlio" (a complete anagram of "Olimar") and mistakes Luigi for a dangerous beast. However, Professor E. Gadd replaced all of the other characters in the final version of the game in order to give the professor a larger role. Comes in with his ship and plucks three Pikmin. In Super Smash Bros. Melee, Olimar appears in the form of a trophy, which is unlocked if there is a Memory Card with saved game data for Pikmin inserted. Captain Olimar's playable debut in the Super Smash Bros. series is Super Smash Bros. Brawl, as one of the game's default fighters. 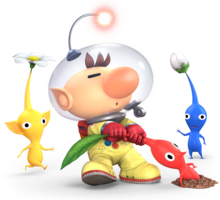 Olimar is one of the smaller and lighter characters in the game. He fights with the help of up to six Pikmin, which follow him and are required in order to perform most of his attacks. Each type of Pikmin (red, blue, yellow, purple, and white) has its own attributes, which produce different effects for Olimar's attacks. Olimar's standard special is Pikmin Pluck, which allows him to pull up more Pikmin (if he has less than six) from the ground. His side special is Pikmin Throw, in which Olimar tosses one of his Pikmin at his opponents. His down special is Pikmin Order, which allows him to call his Pikmin back to his side. His up special is Pikmin Chain, in which Olimar tosses all of his Pikmin in a chain as a tether recovery. His Final Smash is End of Day, in which he takes off while Bulborbs come on the stage and start attacking the players, similarly to the "end of day" sequence from the Pikmin games. His "home" stage is the Distant Planet. One of Olimar's costumes makes him look very similar to his sidekick, Louie. Captain Olimar's Pikmin are attacking a huge R.O.B.. However, the R.O.B. spins around and all the Pikmin that are latched onto him are shaken off and perish. Captain Olimar starts shivering in fear of the robot. A red Pikmin walks up to Olimar and taps him on the side. Olimar turns around and the red Pikmin points at the Blue Falcon that is speeding through the forest. Captain Falcon jumps out of the Blue Falcon and then Falcon Punches the R.O.B., which defeats the R.O.B. instantly. Captain Falcon lands back on the ground while doing a slide similar to the Falcon Kick. However, while he is sliding on the ground, he accidentally kills the Pikmin who are in the way. Olimar and the Captain then team up to fight the Subspace Army. Upon reaching the edge of the Isle of the Ancients, they witness Diddy Kong attacking Primids in order to rescue his pal Donkey Kong. Falcon and a reluctant Olimar then decide to join forces with the Kongs, and upon reaching them, the Primids return with backup. Donkey Kong, Diddy Kong, Captain Falcon, and Olimar manage to fight them off before they see off Falco Lombardi, who had helped Diddy in bringing him to the ship that Donkey was held on. The ship takes Olimar and his crew inside the Subspace Bomb Factory. They eventually find the Ancient Minister, alongside Pikachu and Samus Aran. Ganondorf suddenly appears via hologram and commands the R.O.B.s in the room to detonate the Subspace Bombs inside the factory so he can create a large enough hole in space to fit a Subspace Gunship through. The Ancient Minister through desperation reveals himself to be the leader of the R.O.B.s and helps the other heroes defeat the Subspace enemies that Ganondorf dispatched. Olimar, with R.O.B. and the rest of the heroes, escapes from the island before it is dragged into Subspace. All of the protagonists then unite to take down the Subspace Gunship and enter Subspace. Olimar and the others are subsequently turned into trophies by Tabuu however. Luckily, King Dedede had created badges that revive trophies beforehand, with Ness and Luigi eventually coming to their senses amidst the rubble of Dedede's Castle, which was destroyed by Bowser earlier on. The two eventually decide to revive Dedede and journey into Subspace to revive as many heroes as possible. Olimar is one the trophies that may be revived by them when they enter Subspace. However it is optional for the player to revive him. Olimar appears as a default playable character in Super Smash Bros. for Nintendo 3DS and Super Smash Bros. for Wii U. His appearance has been altered from the previous game, adding a whistle into his helmet like in Pikmin 3. Instead of having six Pikmin like in Super Smash Bros. Brawl, Olimar can now only pluck three Pikmin at a time, and in a certain order (being red, yellow, blue, white, and purple). His up special move has also been changed to Winged Pikmin, in which a pair of Winged Pikmin fly Olimar through the air for a short time; however, the more active Pikmin he has, the heavier he is when using this move. 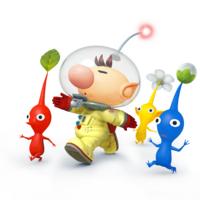 Four of Olimar's alternate costumes replace him with Alph from Pikmin 3, who acts as a separate character to Olimar, while still taking up the same slot as him. Olimar's home stage in the Wii U version of the game is Garden of Hope. 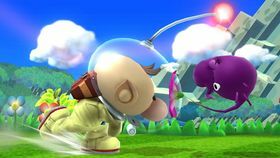 For Equipment, Olimar can use the Pikmin equipment (usable only by him) to increase attack, the Space Suit (also available only to him) for defense, and the Boots for speed. According to Masahiro Sakurai, the developers barely got Captain Olimar working in Super Smash Bros. for Nintendo 3DS, hence why the Pikmin count is reduced to three while the Pikmin are rendered as sprites. Rock Pikmin were originally intended to be part of Olimar's moveset, but the idea was put in hold due to the lack of time. They would have been heavy, with short reach, but high attack power, akin to a stronger version of Purple Pikmin. Alph had even been considered to be a separate clone character until it has been decided to make him an alternate character of Olimar. Olimar returns as an unlockable playable fighter in Super Smash Bros. Ultimate. This time, after Olimar takes sufficient damage, his helmet becomes cracked, though this is merely cosmetic as it becomes fixed soon afterwards. Also, the alternate costume that switches him out for Alph returns. * - Olimar is fought if the player is playing as Alph. Pikmin Pluck is Olimar's standard special move. It allows Olimar to pluck Pikmin from the ground (up to six in Super Smash Bros. Brawl; three in Super Smash Bros. for Nintendo 3DS / Wii U and Super Smash Bros. Ultimate), allowing him to smash attack, use other special moves, perform aerials, and grab opponents. So as long as there is ground to stand on, Olimar can pluck any one out of the five different kinds of Pikmin, each with its own special traits, in a similar fashion to Peach's Vegetable attack. Kirby is also capable of using this attack if he copies Olimar's powers. However, since Kirby is only able to copy a standard special move, and Olimar needs to use other attacks to attack with the Pikmin, Kirby instantly tosses his plucked Pikmin, rather than letting them travel behind him, but the Pikmin slam into his opponents instead of latching on. In Super Smash Bros. Brawl, the terrain influences the probability of getting certain Pikmin. For example, a lava stage may hold more Red Pikmin than usual. In Super Smash Bros. for Nintendo 3DS / Wii U, the terrain no longer influences the probability; the order of the Pikmin is always in the following set order: red, blue, yellow, white, and purple. In Super Smash Bros. for Nintendo 3DS / Wii U, the move comes in two other custom variations, once they are unlocked. Hardy Pikmin Pluck causes Olimar to take longer plucking Pikmin out of the ground, but as a result, they are more durable. 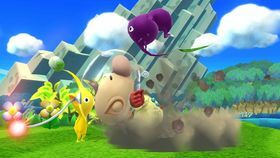 Explosive Pluck is the offensive variant of the special move: plucking a Pikmin causes an explosive effect around Olimar. The pluck rate is slightly slower than normal Pikmin Pluck and Pikmin have less HP as a result. Pikmin that are scattered die in a far shorter time frame than normal Pikmin Pluck. Plucking White Pikmin gives off poisonous fumes while plucking Purple Pikmin is stronger than other Pikmin. 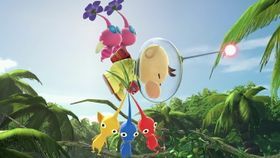 The move in the Super Smash Bros. series is different from the Pikmin games, because Pikmin cannot be plucked out of the ground at any time Olimar wants. They grow from seeds generated by Onions, which must be given Food Pellets to produce Pikmin seeds. Once a sprout appears, Olimar or Louie can pluck the Pikmin. Pikmin Throw is Olimar's side special move and can only be used if Pikmin are next to Olimar. When Olimar tosses the Pikmin at his opponents, they latch onto them, attacking them whilst holding on. This causes the opposing players damage counter to rise gradually, until all the Pikmin are shaken off. 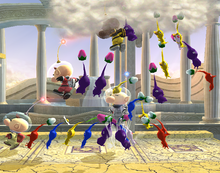 Certain Pikmin do more damage than others, while others have added effects, such as poisoning (White Pikmin). More damage is dealt if more Pikmin are tossed at the opposing players. In Super Smash Bros. for Nintendo 3DS / Wii U, the first custom variant for this move is Sticky Pikmin Throw, which makes Pikmin more resistant to being shaken off, but they deal less overall damage. The second variant, Tackle Pikmin Throw, causes Pikmin to act like Purple Pikmin, they slam into their opponents rather than latch on. If Kirby gains Olimar's Pikmin Pluck ability, Kirby immediately uses Pikmin Throw after plucking a Pikmin. Pikmin Chain is Olimar's up special move in Super Smash Bros. Brawl. It is a tether recovery move that uses at least one Pikmin next to Olimar, which grab onto the edge of a stage if he is falling off. The Pikmin grab onto each others feet, acting as a chain, hence the name. The less Pikmin, the shorter the range of the chain is. Olimar can then pull himself back to the stage if the Pikmin grab onto the ledge. This move does damage and knock-back to foes hit, and if Olimar is in the air, he passes through the opponent to grab the ledge. 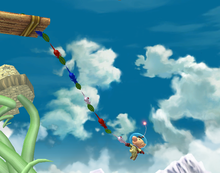 On the ground, Olimar whips the chain diagonally upwards in the direction he is facing, allowing him to hit distant foes. The damage and properties of the attack are dependent on the last Pikmin in the chain, as when he uses the move, the Pikmin assemble in reverse order. Olimar is put into a helpless state if he fails to grab an edge in mid-air. Winged Pikmin is Olimar's up special move in Super Smash Bros. for Nintendo 3DS / Wii U and Super Smash Bros. Ultimate, replacing Pikmin Chain from Super Smash Bros. Brawl. The move calls a pair of Winged Pikmin to carry Olimar into the air, allowing the player to move freely as they fly and gain height. The more Pikmin Olimar is carrying, however, the less distance the Winged Pikmin travel; Purple Pikmin are especially heavy for the Winged Pikmin. The Winged Pikmin also do not fly as far the more times the move is consecutively used. Olimar can end the move early by performing an attacking move, but if the move is carried to its maximum duration, Olimar goes into helpless state. In Super Smash Bros. for Nintendo 3DS / Wii U, the first custom variant for this move is Winged Pikmin Jump, which allows Olimar to quickly travel upwards, but he cannot end the move early. The second variant is Mighty Winged Pikmin, which has the Winged Pikmin fly a set distance regardless of the number of Pikmin Olimar is carrying and recovers faster. Pikmin Order is Olimar's down special move. When Olimar uses this move, he blows his whistle, calling any scattered Pikmin back to him. The attack can also be used to shift the order of Pikmin in Olimar's line-up. The move deals no damage. In Super Smash Bros. for Nintendo 3DS / Wii U, the first custom variant for this move is Order Tackle, which causes Pikmin to travel in a very high arc, damaging any opponents in their path. The second variant is Dizzy Whistle, which causes opponents nearby to turn around, similar to Mario's Cape, and deals small damage to them. End of Day is Olimar's Final Smash, meant to imitate the "end of day" event from the Pikmin games. After collecting the Smash Ball and pressing the special move button, Olimar rushes into his Hocotate Ship. He then flies off into the sky, as the day suddenly turns to night. Olimar's ship goes completely out of sight and a horde of Red Bulborbs from the Pikmin games start attacking opponents on the stage. After about five seconds, Olimar crashes down with his ship, causing an explosion when he lands and dealing heavy damage and knockback to anyone caught in the explosion. If other characters are near Olimar when his rocket appears, they are buried into the ground. In Super Smash Bros. for Nintendo 3DS / Wii U, players can control where his rocket lands. The Final Smash is much faster in Super Smash Bros. Ultimate. Captain Olimar entering the Hocotate Ship for his Final Smash in Super Smash Bros. Brawl. Olimar, as seen in the microgame, Pikmin. Olimar is seen in the WarioWare: D.I.Y. microgame Pikmin, exclusive to versions of the game outside Japan. 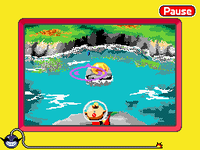 The player controls Captain Olimar, who is holding a Red Pikmin in his hand and must toss it onto a small raft with nectar on it. An attraction called Pikmin Adventure is featured in Nintendo Land. 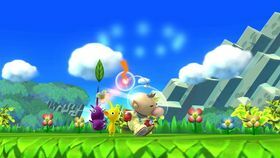 In this minigame, the player with the GamePad is dressed up as Olimar and uses Pikmin figurines to help him locate the lost spaceship. Although Olimar himself does not appear in Mario Kart 8 and its port, Mario Kart 8 Deluxe, more than in a small cameo within the Mii Racing Suits menu, players can scan his amiibo into the game as of the version 4.0 update to unlock a racing suit for Miis based upon his appearance. An Olimar theme is one of the many unlockable amiibo designs for Yoshi in Yoshi's Woolly World and Poochy & Yoshi's Woolly World. By scanning an Olimar amiibo, players can unlock an Olimar-themed reskin for Yoshi. Olimar, alongside the majority of the Super Smash Bros. for 3DS / Wii U cast, cameos as one of the costumes Mario can obtain in Super Mario Maker via the Costume Mario power-up. Upon powering up, Olimar's voice from Pikmin 2 can be heard. 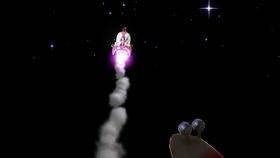 If the player completes a level as Olimar, the "Course Clear" fanfare is replaced by the tune that plays after obtaining an important item in Pikmin 3. Pressing on the controller lets Olimar blow his whistle. "Goodness! Captain Olimar joins the fray with five colors of Pikmin in tow! He plucks Pikmin from the ground and they fight as his allies. Without Pikmin, Olimar can’t even do a Smash Attack. And the short-lived Pikmin tend to scatter. Theirs is a fated symbiotic relationship." "A veteran spaceman who teams up with Pikmin to fight!" GCN Pikmin Veteran spacefarers in the employ of Hocotate Freight. After crash-landing on an enigmatic planet, Olimar met the mysterious beings known as Pikmin. He enlisted their aid to find his spaceship parts and help him escape. Once home, he found his employer on the verge of bankruptcy. He was sent back to the Pikmin world with his partner, Louie, to repay the company debt. Mei Ling: Snake, have you ever heard of the ancient Chinese story, "The Vain Ocean of Wealth and Splendor" from the Zhen Zhong Ji? Snake: I've been waiting for the movie. Mei Ling: Basically, it's meant to express the impermanence of all things. You know, like even when Captain Olimar has lots of Pikmin with him, they could all be gone the next moment. Those poor little guys--they carry, they fight, they multiply...and they get eaten. Olimar might have lots of company one minute and be all alone the next. It's so sad. Snake: But he can pluck out more Pikmin anytime he wants, right? Mei Ling: Well, yeah, I suppose so. Snake: No one truly fights alone. Not even me. Mei Ling: ...You're absolutely right, Snake. Good luck. I'm rooting for you. GCN Pikmin 2 (08/2004) A veteran spaceship pilot for Hocotate Freight, Captain Olimar partners with Pikmin in Smash Bros. to help him in battle. Olimar is much stronger when he's got Pikmin with him, so keep them plucked and good to go. Pikmin abilities are based on their color—learn what each is best at! Captain Olimar, veteran Hocotate Freight astronaut, joins forces with Pikmin again in this game to take on the world. Olimar isn't much of an attacker without Pikmin by his side, so you should always keep some ready. Pikmin have different abilities depending on their colour, so learn how they work to use them effectively! GCN Pikmin 2 (08/2004) Pikmin aren't just good for attacking, you know. For example, when you throw them, they can pick up items on their way back. Only items that aren't very heavy, though! Also, if there's someone charging or shooting at you, a well-timed Pikmin throw can stop them in their tracks! Pikmin aren't just good for attacking, you know. For example, when you throw them, they can pick up items on their way back. Only items that aren't very heavy, but still! Also, if there's someone charging or shooting at you, a well-timed Pikmin throw can stop them. Just don't forget to replace your Pikmin when they're gone! N/A On the planet Olimar is investigating, the native creatures become extra violent at night, forcing him to retreat to orbit every evening. His Final Smash works the same way: night falls and Olimar takes to the sky, leaving his foes to the mercy of the wildlife below. Olimar returns when dawn breaks and you can adjust his less-than-safe landing! On the planet of the Pikmin, the native creatures get quite violent come nightfall, so Olimar retreats into orbit every evening. That's how his Final Smash works, too: Olimar takes off in his trusty Dolphin,[sic] then in comes the beasties to take care of the other fighters. When Olimar returns, make sure he touches down, er...safely! Pit: Oh, it's that explorer guy. Palutena: Did you know that Pikmin are named after Pikpik carrots, a vegetable native to Hocotate? Pit: Huh. Guess you learn something new every day. Viridi: Enough with the pointless fun facts. Let's talk fighting strategy. Here's what I know about those Pikmin. Red Pikmin are strong! Yellow Pikmin fly high! Blue Pikmin have the mightiest throw! White Pikmin are fastest! Purple Pikmin are heavy and the most powerful! Be sure you remember all this, Pit. Palutena: There are also Winged Pikmin that don't attack you. Numerous Pikmin will weigh down the Winged Pikmin. And that's when you should attack! The misspelled name on the website. In the Super Smash Bros. series, Olimar's eyes never glow yellow if he has broken the Smash Ball, not even if he is attacked. On his fighter page on the desktop version of the official English Super Smash Bros. 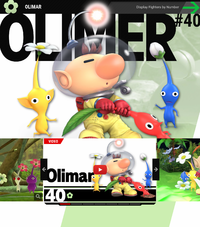 Ultimate website, Olimar's name was originally misspelled "Olimer." This mistake has since been corrected. ↑ Soma. (July 29, 2015) “I Answer Some Questions,” Sakurai Famitsu column vol. 461-464, on Ice Climbers, clones, and Smash Run SourceGaming. Retrieved October 28, 2015. ↑ Spazzy_D (July 29, 2015). Smash Bros. Roster Cuts SourceGaming. Retrieved October 28, 2015. ↑ Masked Man (July 3, 2015). Additional Cut/ Dropped Content in Smash for 3DS/Wii U. SourceGaming. Retrieved October 28, 2015. ↑ Masked Man (July 29, 2015). Plucky Little Guys: Olimar and Alph in Smash 4 SourceGaming. Retrieved October 28, 2015. This page was last edited on March 13, 2019, at 21:53.